Reports such as this one come at a time in which many political observers are sounding the alarm bell that we are amid an era of resurgent authoritarianism. Though it is a stretch to say that democracy in the United States will collapse any time soon, a number of developments there and elsewhere are indeed cause for concern for global democracy. The first is the growing attractiveness of populism among democratic audiences. In a number of well-established democracies, such as the United States and Hungary, we are seeing leaders who promote populist agendas gain power. The messages they advocate are similar: the country needs a strong leadership, elites and experts cannot be trusted, and established institutions are failing. The rising popularity of populism worldwide is troubling, however, because populist agendas are increasingly being used as a springboard for the dismantling of democracy, such as occurred in Venezuela under Hugo Chavez and Turkey under Reccep Tayyip Erdogan. In such places, populist leaders dismantle the foundations of democracy by putting loyalists in key positions of power (e.g. the judiciary), sidelining the media by censoring it or legislating against it, and muzzling civil society and political opponents. Importantly, their efforts to consolidate control are often difficult to push back against because they occur under the guise of “saving” the country. Relatedly, a second cause for concern is the increasing reliance on pseudo-democratic tactics as a tool for maintaining power among today’s authoritarian regimes. Examples include not only the adoption of elections, incorporation of multiple political parties, and maintenance of legislatures, but also the creation of non-governmental organizations (which are actually government sponsored) to feign support for civil society, establishment of consultative forums to co-opt potential opposition, and use of fake election monitoring groups to validate what are actually unfair contests. Today’s authoritarian regimes are wise to engage in such actions. Those dictatorships that more closely mimic the behaviors of democracies last longer than their more traditional counterparts. Of course, this reality is not lost on today’s autocrats. 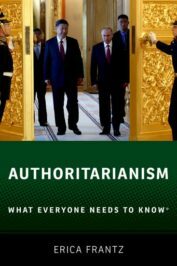 We are seeing more and more authoritarian regimes feign democracy (in name only), such that the typical dictatorship today is far more long-lasting than its predecessor in decades past. The increasing resilience of contemporary dictatorships, coupled with the difficulty of chastising behaviors that “appear” democratic, has generated a new set of challenges for pro-democracy activists living within them and in the international community. In a number of well-established democracies, such as the United States and Hungary, we are seeing leaders who promote populist agendas gain power. The messages they advocate are similar: the country needs a strong leadership, elites and experts cannot be trusted, and established institutions are failing. A third cause for concern is the evolution of today’s dictatorships from a more collegial style of governance to a system of strongman rule. In the past, the typical dictatorship featured a strong and institutionalized political party (or in some cases a professionalized military junta). In such regimes, the leadership group could potentially check the actions of the leader and hold the leader accountable for poor policy choices. Today’s authoritarian regimes, by contrast, increasingly feature weak and disorganized political parties that revolve around the personality or charisma of the leader. The movement toward more personalist authoritarian rule, where power is concentrated in the hands of the leader, is worrisome on a number of fronts. Personalist dictatorships are more likely to start wars with democracies, pursue reckless foreign policy agendas, waste foreign aid, and invest in nuclear weapons, among other things. The trend toward greater personalism in new dictatorships, such as in Nicaragua under Daniel Ortega, established dictatorships, such as in China under Xi Jinping, and potentially in democracies, such as in Poland under Jaroslaw Kaczynski, is, therefore, a troubling development. Doomsday commentary about the state of democracy in the world is perhaps overly pessimistic. After all, we have seen democratic gains in a number of countries around the world in recent years, such as in Sri Lanka, Burkina Faso, and the Gambia. That said, developments such as these are disconcerting, and advocates of democracy would be wise not to ignore them. Featured image credit: Freedom Democracy America by Wokandapix. CC0 via Pixabay. Erica Frantz is Assistant Professor in the Political Science Department at Michigan State University. She specializes in authoritarian politics, with a focus on democratization, conflict, and development. Frantz is also interested in the security and policy implications of authoritarian rule. She has written four books on dictatorships and development, and her work has appeared in multiple academic and policy-oriented journals.